It was a long Christmas break made all the longer due to the fact that I caught a bug on New Year's eve. I'm pretty sure I even know how, I blew on a random party horn at the bar. Clearly the owner was diseased because the next morning, my throat was scratchy and I wasn't feeling right but it wasn't a hangover. Turned out to be some sort of chest infection or flu. I was bed ridden for days and had no interest in alcohol so despite my loathing of Dryanuary as a concept, it was forced upon me. I'm now back in action, appetite is back as well as my thirst. It was a ropey start last night. I opened a bottle of 8 Degrees Hurricane and in between mouthfuls, I managed to knock the same beer over twice, each time spilling precious liquid on the floor. Clearly, responsible drinking requires constant training and a week off means you need to ease yourself back in. Anyway, Pauline drove me to Kinsale for lunch at Fishy Fishy first and then we visited a number of other local towns while heading towards her local town of Skibbereen and then on to one of the islands half way between Skibb and Baltimore. If your'e wondering does she know the rowers, Gary and Paul O'Donovan? The answer of course is yes. She even drove them to their first disco back in the day. 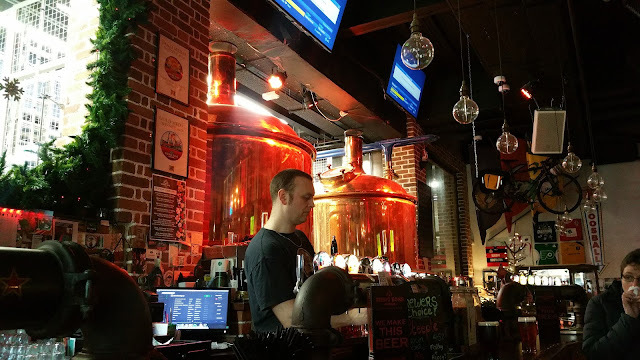 Later that evening, she drove me to Baltimore so I could visit Casey's and the West Cork Brewing Company. We sat at the bar and I went through all the beers. Unfortunately there was no cask on, a pity because their Roaring Ruby won the cask competition I ran at the Cask Ales & Strange Brews fest last year. The next one is actually on in a few weeks. The stout was of course my favourite but I was also given a sample of a pilot batch of IPA by Dominic. I promptly threw this all over myself in an "Airplane" drinking problem kind of way. The little glass slipped through my fingers. Another was poured which I gripped like a baby grips a bottle and survived. It needs a little tweaking but it has the makings of a good English style IPA with a big orange marmalade thing going on with some pithy bitterness. While I was drinking, Pauline caught up with Declan who of course she knew. It's a small world in west Cork. Cathal from Rascal's is from there too and went to school with her brother. 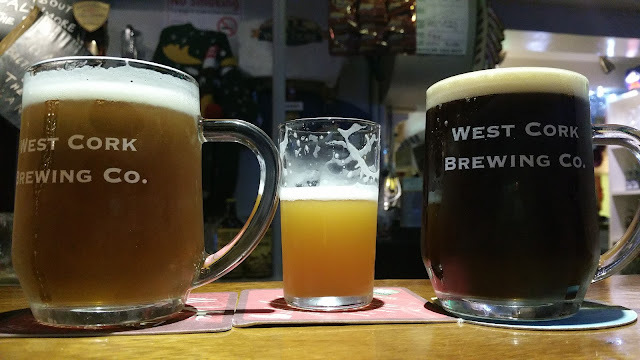 It was great to be back in Cork and I will back down again at the end of the month for the Cask Ales and Strange Brews festival where I will be judging cask beer. 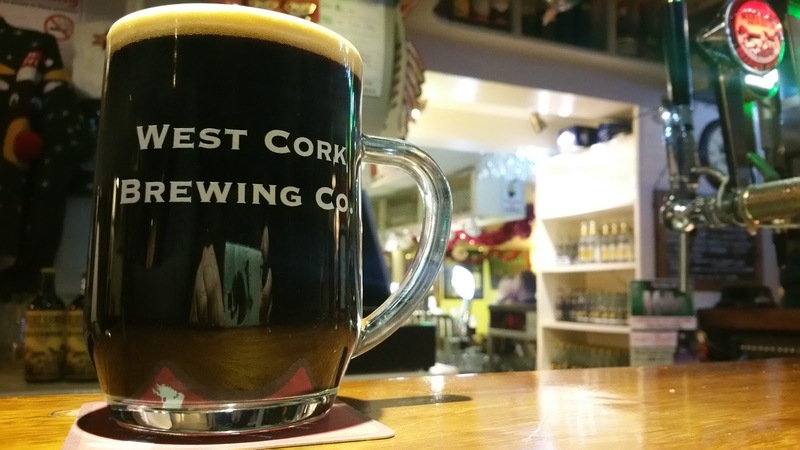 So were those West Cork beers bottled or kegged? Kegged, I saw the bottles on the bar though. Pretty much the same as St Peter's. The pale ale on the left doesn't do itself any aesthetic favours. Indeed not, but I've had awful-looking great-tasting beers from them before. Didn't know they kegged, though. Not only do they keg (and cask), but they are getting ready to move the operation to a larger premises and expand.